It’s true that we can become immune to the extraordinary possibilities in our everyday experiences and encounters. Familiarity with the routines of the everyday does indeed breed a certain ‘take-for-granted’ attitude. We can easily by-pass the potential to see and be inspired by those around us – the selfless and the tolerant, the encouraging and the courageous, the creative, the resilient, the joyful, the generous and the generative. We can miss their haloes. 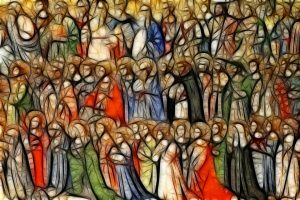 We can fail to spot those saints in our midst who are revealing to us some aspect of the many facets of the face of God. For that is the mission of haloes – to reveal to us something of the sacred, of God, who is Love. And if we are attuned to God’s presence, we can also be moved by that spark of the Divine in those who are pushed aside, dismissed, left out, undermined, underfed, unhoused or simply unseen and unheard. Mary was the compassionate face of God for people in her time. Her life and her example continue to inspire us today. Perhaps the invitation of today’s Feast of All Saints is go halo hunting. Let’s see if we can spot the haloes around us and reverence the spark of divinity we meet there. We might even dare to look in the mirror and stand in awe at the face of God reflected there. Happy Feast Day! Ron Rolheiser, “Praying so as to see God’s Glory Inside of Humanity.” 18 December, 2011. Quoted in Ron Rolheiser, ibid. Teilhard de Chardin is quoted in Ron Rolheiser, “The Fire that Shimmers Deep Within Things.” 4 Dec, 1995. Image within article obtained from pixabay. Used with permission.